Tracking System - Universe Galaxies And Stars Section. ESA Tests Cargo Ship Tracking System. European Space Agency: Image credit: http://www.esa.int/export/esaCP/SEMXIUYV1SD_index_1.html. The European Space Agency has successfully tested a new tracking system that will allow its new automated cargo ship dock to the International Space Station. 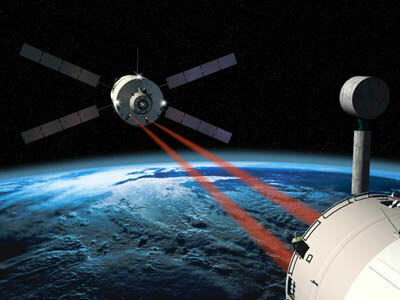 The "videometer" (VDM) is a device attached to the Automated Transfer Vehicle (ATV) which uses eye-like sensors to track the position and orientation of the station to dock with it. The device was tested in a 600-metre long building, with the VDM guiding a simulated vehicle approaching a station mockup. It locked on at 313 metres and guided the simulated vehicle into dock perfectly on the first test. Inside an exceptional building, 600 metres in length, a 120 000 kg mobile platform, able to ride on 580 metre long rails, enabled the simulation of a continuous approach between the two space vehicles from a range of several hundred metres to within almost docking distance. On the platform, a set of passive rendezvous targets (retroreflectors), identical to the ones to be installed on ISS, were facing the videometer which was mounted on an articulated robotic arm (with six degrees of freedom) representing the ATV motion.